Like its famous Portugese explorer namesake, Magellan is all about charting the unfamiliar. The company makes the Roadmate and Maestro lines of portable car GPS systems, alongside the eXplorist line of outdoor handheld navigation products. The Roadmate family consists of three product groups, with devices coming in a range of screen sizes from 3.5" to 7". The Auto Series provides essential navigation features, the RV Series adds RV-specific routes plus a travel guide and campground directory, while the Commercial Series adds truck-specific features such as customizable truck routes based on vehicle dimension, and also logging and reporting for driving hours and mileage. Magellan Roadmate devices make use of the following suffixes: (T) free lifetime traffic updates, (LM) free lifetime map updates, (MU) one time map update. The product number indicates screen size, with higher numbers used for devices with bigger screens. 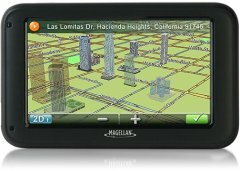 Check out these car GPS systems from Magellan. As a buying guide, features and pictures are provided for each model. Based on this 's aggregated ranking of 78%, we believe that the Magellan RoadMate 5120LMTX is, as of now, Alphachooser's best Magellan car GPS 2019. Furthermore, we think that our sample of 81 reviews from our sources gives us a high confidence level (more on confidence levels) that justifies labelling it a "no-brainer best choice." 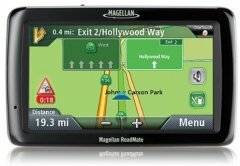 Based on 3.5 stars averaged over 789 reviews, here is second best Magellan car GPS. * By the way, this list is based on a full computation of hundreds of reviews from across the web. Aside from having the Android OS and RV-specific POIs, this 7-inch GPS tablet can also function either in car or RV mode. 7-inch feature-rich RV GPS that comes preloaded with directories of AAA-approved points of interest, RV dump locations, and Good Sam RV parks and campgrounds. Coming with RV Sani-Dump Station Locations, the 2013 Good Sam RV Travel Guide, and customizable routes depending on whether you drive a motorhome or RV trailer, this RV GPS sports a 5-inch screen. 7-inch GPS for RV owners with 2GB of memory. Withstanding temperatures as low as 14 degrees F and as high as 140 degrees F, this rugged IP67-rated GPS is specifically designed to explore at least 100000 off-road routes with the help of its 8-hour battery life and details of the destinations given by its user-input feature. The Magellan RoadMate 9412T-LM GPS adds free traffic updates to its list of features, which includes a 30-minute unplugged usage time and 4GB of memory. Aside from being able to display selected bulidings and landmarks in 3D, this 7-inch (portrait or landscape) car GPS also comes with a Find Your Car feature. Operating on a 400MHz Cortex A9 CPU core, this 7-inch car GPS also has free lifetime map updates and landmark guidance, as well as traffic-cam alerts and parking help. This 7-inch car GPS does not reinvent the wheel with its free lifetime updates (map and traffic), 4GB-memory, and a 30-minute limit without the plug. Low-priced (sub-$100) basic car GPS with an extra-large (7-inch, 800 x 480 pixels) screen, making it fit for use with large trucks and recreational vehicles as well. Feature-rich 7-inch GPS with integrated Bluetooth speakerphone, backup camera connector and 7 million points of interest. 7-inch WVGA RV GPS preloaded with campground locations plus a multiple-destination routing feature. Large-screen GPS with a backup camera input and a Samsung CPU. Simpler version of the 9250T-LMB that doesn't feature Bluetooth but still has 7 million points of interest and free map and traffic updates. Higher-end 7-inch GPS, but without free lifetime map updates and only 30 minutes of battery life. There is also a speakerphone. RV and truck GPS with a 7-inch display and free lifteime map updates. This 0.8-pound, 7-inch GPS has truck POIs, fuel price updates, and customizable truck routes, obviously aiming itself towards truck drivers. This commercial truck GPS comes with a log and status reporting feature, PhantomALERT premium, and customizable truck routing, on a display size of 5 inches (which can be limitative for truck users). A 7-inch screen, an HOS and IFTA logbook, Bluetooth 4.0, and SmartGPS Eco cloud content (weather forecasts, fuel prices, etc.) are some of the main features of this truck GPS. This 5-inch truck GPS adds free lifetime map and traffic updates to its set of features, which include truck POIs, lifetime traffic camera alerts, and a battery time of up to four hours. A 7-inch truck GPS with free lifetime map and traffic updates, the usual customizable truck routes and avoidances, and a small battery life (30 min.). This car GPS seems to compensate for its smaller 5-inch display with some modern specs: Bluetooth, landscape or portrait viewing 3D buildings, etc. 5-inch high-resolution (800 x 480) car navigator with a built-in wide-angle (120-degree) view HD dash camera, and a shock sensor that automatically records sudden vehicle impacts and speed changes. 5-inch GPS system with an included back-up camera. This 5-inch 6.08-ounce GPS offers average features, such as landmark guidance, 7,000,000 points of interest (POIs), and a 30-minute uncorded usage time. This 5-inch car GPS mostly distinguishes itself with its 3D landmark feature and its alerts for traffic cams. Included traffic camera alerts (by PhantomALERT), free lifetime map updates, and a 5-inch display are some features that the Magellan RoadMate 5322-LM GPS has to offer. This 5-inch car GPS displays selected buildings and landmarks in 3D, offers two hours of battery usage and free lifetime map and traffic updates. With a built-in HD dash cam, this 5-inch GPS groups itself with other models following the "built-in cam" trend, and adds a G-Shock sensor. 5-inch car GPS with PhantomALERTS and Landmark Guidance features, on top of free lifetime map updates. 5-inch smart car GPS, with features found in premium in-dash infotainment systems -- such as social media and other internet services -- on top of Magellan signature navigation at a lower price. 5-inch Android-driven automotive navigator that sports a multi-touch glass display and uses familiar landmarks to describe directions instead of simply naming street names. 5-inch car GPS that features an Android operating system and a multi-touch glass screen. 5-inch GPS without traffic updates but with free map updates, landmark guidance, parking information, etc. Entry-level 5-inch GPS without free map updates (sold separately) but with free traffic updates and a high-sensitivity receiver. Ultra basic 5-inch GPS with map and traffic updates, a protective case, but apparently no speed limit indicator. The Magellan RoadMate 2240T-LM GPS flaunts a 4.3-inch display in a thin build (0.58-inch thick) and offers free PhantomALERT traffic camera warnings as well as free lifetime traffic and map updates. This 4.3-inch car GPS does not have much to boast about, but rather has average specs like a 2-hour battery usage time, free lifetime traffic and map updates, and landmark guidance. 4.3-inch GPS with landmark guidance and free map and traffic updates. Mid-range 4.3-inch GPS with map updates (not traffic), landmark guidance and parking information. Mid-range 4.3-inch GPS with free map and traffic updates and speed limit indicator. One of the lightest of its type (0.31 pounds), this 4.3-inch GPS comes with free lifetime updates for maps and can go for just up to 30 minuted without the plug. This classic entry-level car GPS comes with free lifetime map and traffic updates, a 4.3-inch display, and periodic reporting. This 4.3-inch car GPS has rather usual specs, except for a processor speed of 400 MHz, which is one of the lowest we have done. Low-priced 4.7-inch GPS with little detail from the manufacturer, put aside the usual features expected in a modern GPS. 7-inch GPS with free map and traffic updates. Basic 4.7-inch car GPS designed for fast and convenient navigation, featuring Magellan's OneTouch favorites menu, a built-in AAA TourBook Guide, as well as an intelligent search function.